So far this year, we’ve seen the Phantom V update from Google and “Fred,” an algorithmic update that still remains difficult to parse for its true meaning. 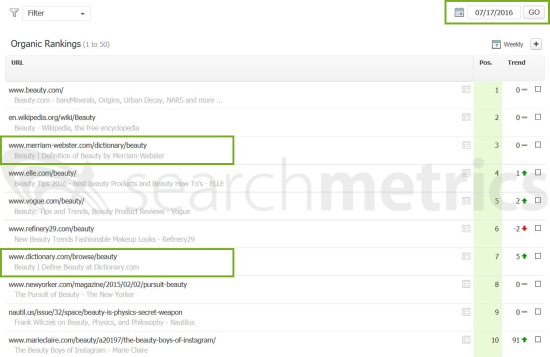 Now there’s another update, unconfirmed by Google that is rocking the search engine results page. 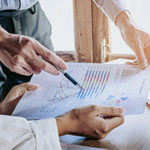 Beginning in the last week of June, there’s been sharp fluctuations in mid-tier results, a decline in Wikipedia visibility and a rise in SEO visibility for several online dictionaries. Our theory: there has been not one, but multiple updates that could affect online marketers. Read on for all the information on the latest developments and changes in the Google search results. Google Update on June 25th? There’s no discernible pattern, but there was definitely significant turmoil around the 25th of June 2017, particularly affecting the results across positions 6 to 10, according to an analysis by Search Engine Journal. 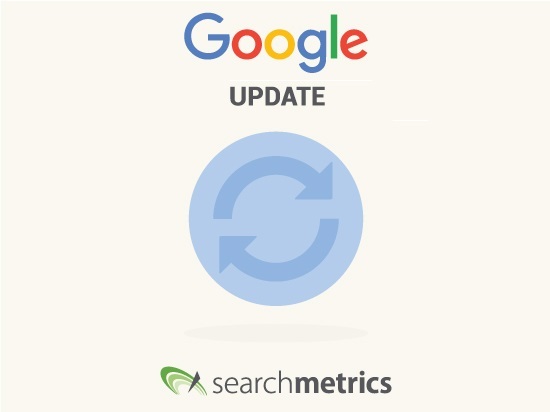 Over at Search Engine Roundtable, Barry Schwartz also initially reported on an update and asked webmasters to share any unusual ranking changes. However, after no clear patterns were identified, he put his investigation into the finer points of this presumed update on hold. Enter our own search data. We’ve checked the US desktop search index for Google.com, and also find no clear pattern that would suggest a major algorithm update, but did notice a few interesting things. The SEO Visibility of dictionary websites has been growing since the start of the year. Whilst the big market leader dictionary.com (and its sister site thesaurus.com) has remained fairly constant, other dictionary pages have seen considerable growth. 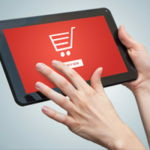 Whilst there was a slight upturn as early as February, we observed a clear, consistent surge for several websites in this category at the end of June. The percentages indicate the increase in SEO Visibility for each of four dictionary domains in the three-week period between 25th June and 16th July. 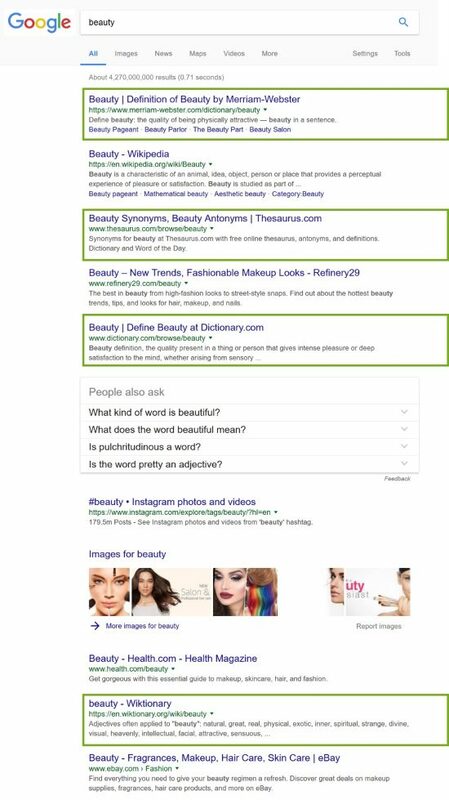 As an example of the growth in SERP presence of dictionary pages, for the keyword “beauty,” despite the inclusion of suggested questions and images as extended search elements, we still find four dictionary pages on the first results page, including three of the top five organic results. When we compare this with the equivalent SERP from one year ago, we see that in July 2016 there were only two dictionaries in the top 10, of which only merriam-webster.com broke the top 5. It is possible that Google is examining whether the user intent behind short-tail keywords with a high search volume could be looking for definitions. This is the idea of “Query Deserves Diversity.” Some search terms return a variety of different results because the user intent is not always the same (or clear) based on the entered keyword. 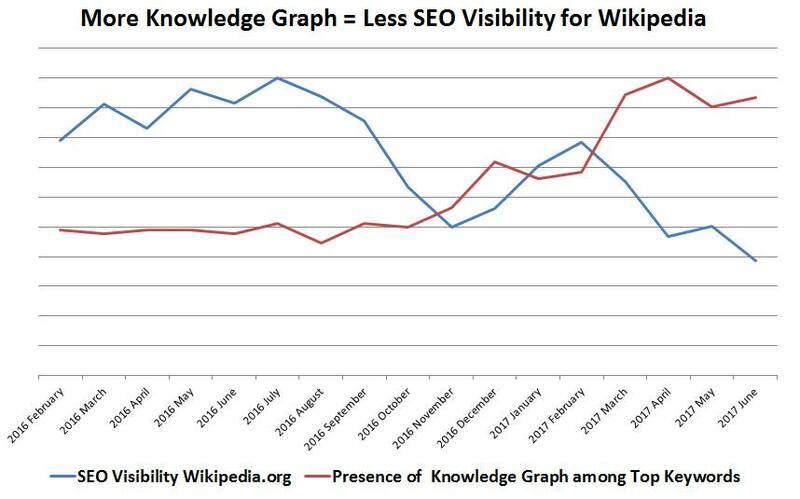 An analysis of the Google.com US index conducted by Searchmetrics expert Malte Landwehr reveals that since March, the number of Knowledge Graph integrations has risen for Wikipedia’s top keywords. This tallies with wikipedia.org’s drop in SEO Visibility, which is currently 4 percent below its yearly peak, achieved on 6th March 2017. This suggests that Wikipedia is no longer ranking as highly for keywords that have a Knowledge Graph integration. SEO industry experts are also assuming that URLs that are displayed in the Knowledge Graph are no longer showing up in the organic SERPs. If you have your own examples (or counter-examples) let us know! Other developments in the search results could point to a core algorithm update having taken place. There have been some domains whose SEO Visibility went down in February and have now bounced back. Two examples are spotify.com and reddit.com. Looking at their SEO Visibility curves, we see simultaneous dips earlier in the year that have now been overcome. This could be a result of Google re-evaluating the content on these domains, leading to a noticeable recovery in their SEO Visibility. Another change that has been visible for some time concerns the information sources for Direct Answers or featured snippets. For some searches, the text content comes from one URL, yet the image integrated into the same snippet box is drawn from another source. The text content in this example is drawn from a list on incredibleegg.org, while the image is sourced from simplyrecipes.com. Even if clicking on the image in a Direct Answer leads to the Google image search and not straight to the source URL, this is still a noteworthy change. 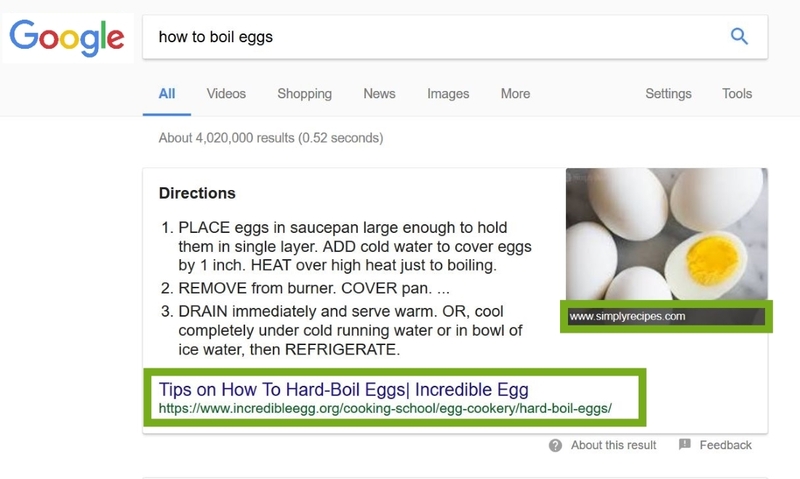 One can notice that incrediblegg.org does have its own image – a picture of boiled eggs that ranks near the top of Google’s image search results. the re-assessment of content and recovery for certain types of page. All in all, these kinds of change to the SERPs, affecting various different kinds of domain in a variety of ways, are to be expected given Google’s approach to constant, real-time tweaking of its algorithm, as opposed to the manual roll-out of major Google Updates that used to be the norm. Thats why you should always do everything according to Google standards and you will not run into trouble. 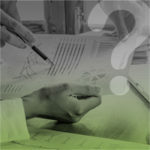 Its the websites that had shady seo work done on them that are dropping or getting penalized. That’s great news, I’m currently looking for SEO trends and I found this one. Thanks Jan! 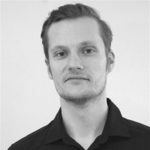 Thanks to inform this blog to helping me gain more info in digital marketing.Can you tell me how to extra work and manage ORM our company.